The Encyclopedia is the first comprehensive guide to the history of Japanese immigrants in the western hemisphere. 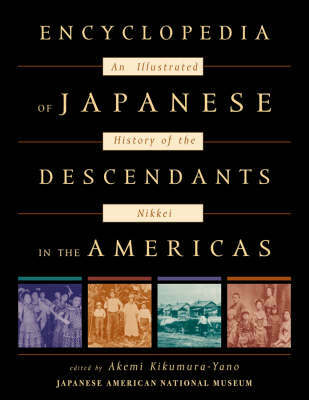 It is the story of the Nikkei (people of Japanese descent and their descendants) from early immigration to the present, as they settled in the countries of Argentina, Bolivia, Brazil, Canada, Chile, Mexico, Paraguay, Peru, and the United States. Each chapter provides four primary areas of information: an historical overview, a bibliographic essay, an annotated bibliography, and supplementary materials including demographic data, and rare historical photographs. Noted scholars Gary Okihiro and Eiichiro Azuma provide key introductory essays on the historical context of Japanese migration from 1868 to the present. It is a valuable resource and fascinating , multi-faceted portrait of Japanese Americans for many audiences: researchers and all people of Japanese and Asian descent. The Foreword is by United States Senator Daniel K. Inouye.